Image caption The global recall affects consumers in several countries including Britain, China and Sudan. 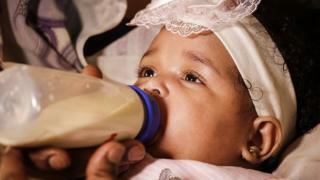 French baby milk formula maker Lactalis has ordered a global product recall over fears of salmonella contamination. Health authorities in France said 26 infants in the country have become sick since early December. The recall affects products and exports to countries including Britain, China, Pakistan, Bangladesh and Sudan. It covers hundreds of baby milk powder products marketed globally under the Milumel, Picot and Celi brands. Lactalis is one of the world's biggest dairy producers. Company spokesman Michel Nalet told AFP "nearly 7,000 tonnes" of production may have been contaminated, but the company is currently unable to say how much remains on the market, has been consumed or is in stock. Lactalis believes the salmonella outbreak can be traced to a tower used to dry out the milk powder at its factory in the town of Craon in northwest France, according to AFP. All products made there since mid-February have been recalled and the company said precautionary measures have been taken to disinfect all of its machinery at the factory. The recall expands a health scare that started at the beginning of December after 20 children in France under the age of six fell sick. At the time a limited recall was issued but regulators found the measures Lactalis had put in place to manage the contamination risk were "not sufficient". Salmonella bacteria can cause food poisoning and symptoms include diarrhoea, stomach cramps and vomiting. The illness, caused by intestinal bacteria from farm animals, is dangerous for the very young and elderly because of the risk of dehydration. It is not the first time the baby milk formula industry has been rocked by a health scare. Six babies died and around 300,000 others fell ill in 2008 after Chinese manufacturers added the industrial chemical melamine to their infant milk powder products. Why is Asia demanding so much baby formula?